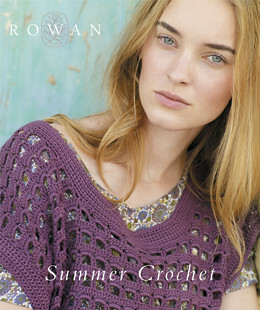 I also found out that Rowan has put out their first ever Crochet-only booklet. This is exciting! It’s frustrating to buy “knit and crochet” magazines for only one or two crochet designs (although I would do it, if I was sure I wanted to make it) and it’s so nice that they have put out an entire collection of classic, wearable crochet. You can bet I’ll be poking my LYS owner to order this one– if you crochet, and want to see more of these kinds of things, I encourage you to “vote” with your dollars. Thanks to Rebecca at A Slice of Life for the heads up on this one! Ooh, and, thanks to the Crochet Today blog, I noticed Secret Pocket is hosting a giveaway of her lovely magnets made from doilies and lace. Very cute- head over and enter to win a set. And, just by chance a customer mentioned Haruni, a beautiful (free!) knit shawl pattern that gets a little help from the crochet hook during the cast off to create the looped edge. Gorgeous! One day I will knit that well and casting off with crochet will be a breeze. But if one of you wants to knit the knitted part and then let me do the crochet part, I think that’d be a fair trade (not). I added to my favorites, hopefully to be moved to my queue one day. In the meantime, I keep crocheting away. As promised, here is a little peek at the crochet cardigan (ravelry link) I am making myself. I am mostly done with the fronts and back, and now need to add the edging and sleeves (if I can decide what I want there), then weave in the remaining ends. It has been fun to work this one. I’m not sure how much wear I will get out of it but I love the color and I hope the end result is flattering. The big motifs are making me wonder, though. So, what kind of crochet love have you seen around the net lately? By the way– thank you to everyone who has purchased my Cables and Lace Scarf Pattern. There are still a few days for you to get it at the sale price of $2! Just so you know, I love nothing more than to see completed projects from my patterns, so if you do make it, please add your completed versions to Ravelry or email me a photo. I also wanted to remind you that 50 percent of proceeds from all of the rest of my patterns (or things in my etsy) will be donated to Doctors without Borders through February 15th. I even (finally!) added a pattern page to my website with more descriptions of each pattern, in case you aren’t on Ravelry. I have a feature on my blog, which I use as a scrapbook for projects and reminders of "inspiration pieces" for future projects. 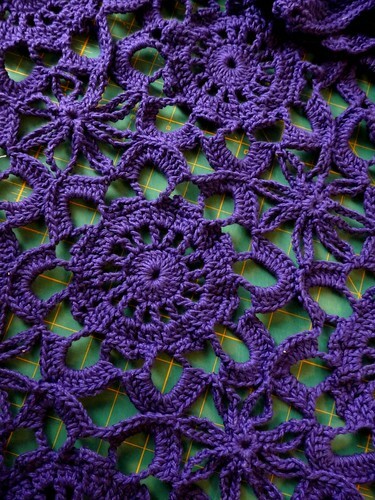 Would you mind if I lift the photo of your purple motif and link back to your blog? It's gorgeous! not at all! as long as you link to this post, i am fine with you using it! I ditched the idea of knitting because having worked at a keyboard for 20 years, something didn't feel right in the wrists, but crochet I imagine is different and maybe a good thing to do on public transport to and from work. Hi Eeloh- Well, might I recommend my book and the book that FuoriBorgo used, Crochet Adorned? It has solid beginner info (although I really suggest taking a class locally if you can) as well as information on how to trim clothes with edgings, flowers, motifs, etc. Check it out at the bookstore if you'd like to see what kind of edgings are in there before you buy. You may also be able to find some tutorials on the web if you search, but I can't think of many off the top of my head. (well, there is this tutorial that I did last year, but I highly recommend you hand stitch the blanket stitch if you give it a go: http://www.craftstylish.com... (of course, your hook and yarn don't need to be so small). good luck! it is a fun hobby and great for transportation (easy to put down in an instant), i'd just be careful and pay attention to your body if it starts to bug your hands- people have differing opinions on which one is "easier" on the hands. oh, and try the clover soft touch hooks, they have warmer, bigger handles that are easy to grasp. Wow! A crochet book from Rowan -- guess crochet really is coming into vogue. Thanks for all the great links!